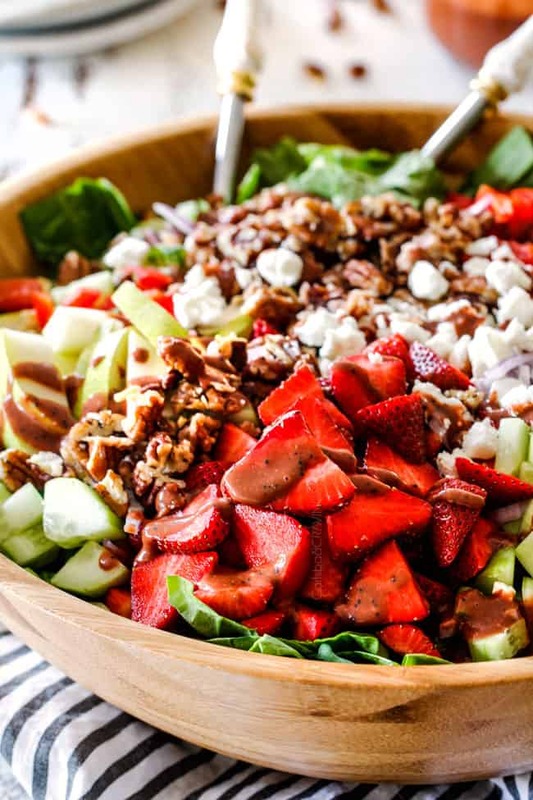 Strawberry Salad bursting with juicy strawberries, creamy goat cheese and caramelized pecans with wonderfully delicious Strawberry Balsamic Vinaigrette is your show stopping side to all your spring and summer parties and potlucks. 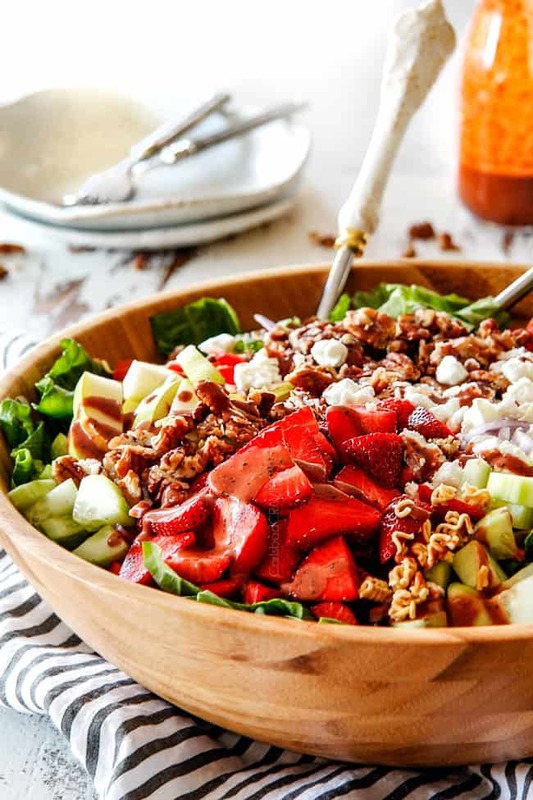 This Strawberry Salad is a fresh, sweet and tangy crowd favorite perfect for every occasion from Easter to Mother’s Day to today’s dinner. The combination of sweet, salty, tangy creamy, and crunchy is everyone-beg-for-the-recipe worthy. If you are still looking for last minute Easter recipes, look no further than this Strawberry Salad! This bright and beautiful Strawberry Salad is brimming with fresh spinach and romaine, ripe strawberries, creamy goat cheese, crisp red bell pepper, crunchy cucumbers, sweet caramelized pecans, zippy red onion and crunchy toasted ramen then doused in sweet and tangy Strawberry Balsamic Vinaigrette. Oh my yum. Although this easy Strawberry Salad is loaded with flavor, it’s super simple to make and I’ve included tons of ways you can customize it to suit your mood and refrigerator as well as how to make this salad ahead of time for stress free entertaining or dinner side. While this Strawberry Salad is traditionally made with spinach, I prefer a blend of spinach and romaine lettuce. The romaine adds more crunch and texture which is a big win in my book. Of course, this point is totally flexible and up to your personal preference. You can use both romaine and spinach in your Strawberry Salad or all one or the other. 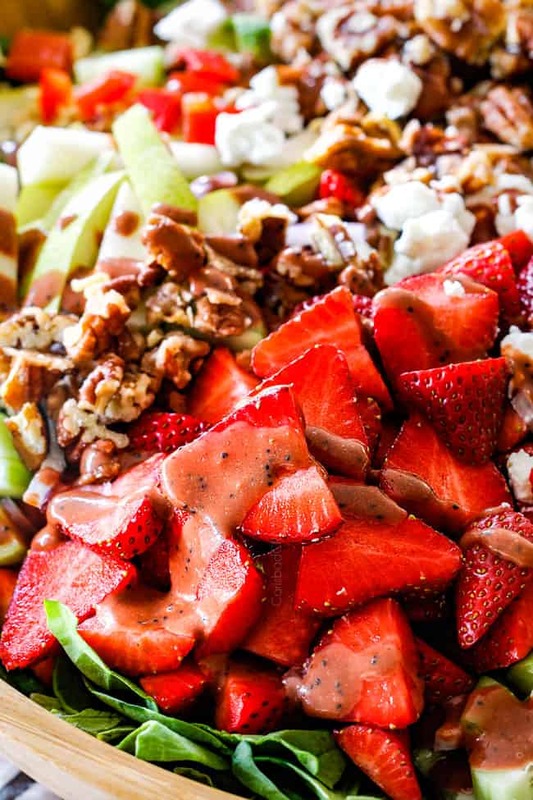 Strawberry Salad and caramelized pecans go together like macaroni and cheese. They are exponentially better together. You can buy Candied nuts at specialty store or use your own favorite caramelized or candied nuts recipe, but I always use my 5 Minute Perfect Caramelized Nuts recipe for all my salads and sides because it literally takes just 5 minutes! To make Caramelized Pecans, simply add pecans, sugar and butter to a nonstick skillet and stir constantly. The sugar will begin to clump around the nuts then will melt to envelop the nuts in a smooth buttery sugar coating. Immediately transfer caramelized nuts to parchment paper so they don’t continue to cook and burn. The Caramelized Pecans will harden as they cool. That’s all the effort required for the delightful sweet crunch that you will crave in every bite of your Strawberry Salad. I’ve used this Caramelized Nuts recipe on everything from pistachios (Berry Spinach Salad) to walnuts (Apple Cranberry Bacon Salad), to almonds and of course pecans (Roasted Butternut Squash Salad). So feel free to switch up the nuts to your favorite nuts or whatever you have on hand. Salad is all about – and only as good as – the dressing. I have a classic Strawberry Salad Recipe with Poppy Seed Dressing coming soon, but for this jazzed up version, I went with Strawberry Balsamic Vinaigrette. And it is ah-mazing. 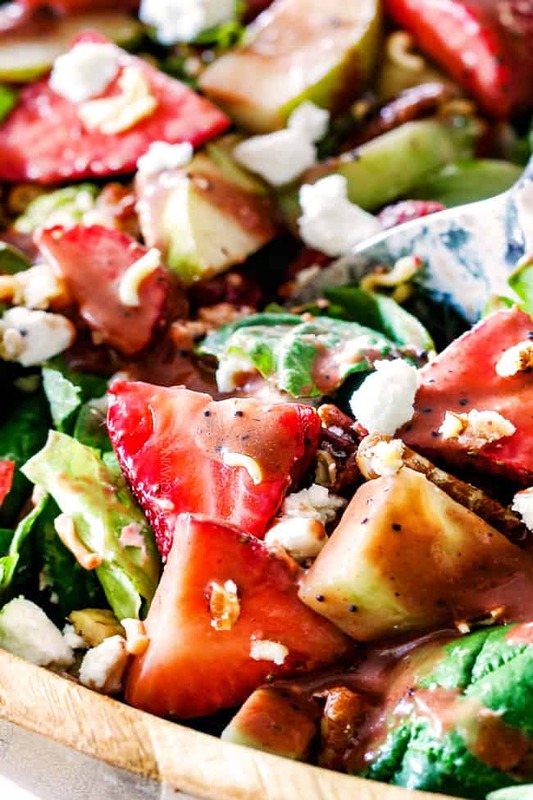 This Strawberry Balsamic Vinaigrette is beautifully rich with a strawberry undertone and sweet-tart acidic bite. It’s sweet and sour, complex and simple all at the same time. Classic Poppy Seed Dressing has loads of sugar but this Strawberry Balsamic Vinaigrette gleans its sweetness from the strawberries and only 1 tablespoon sugar. 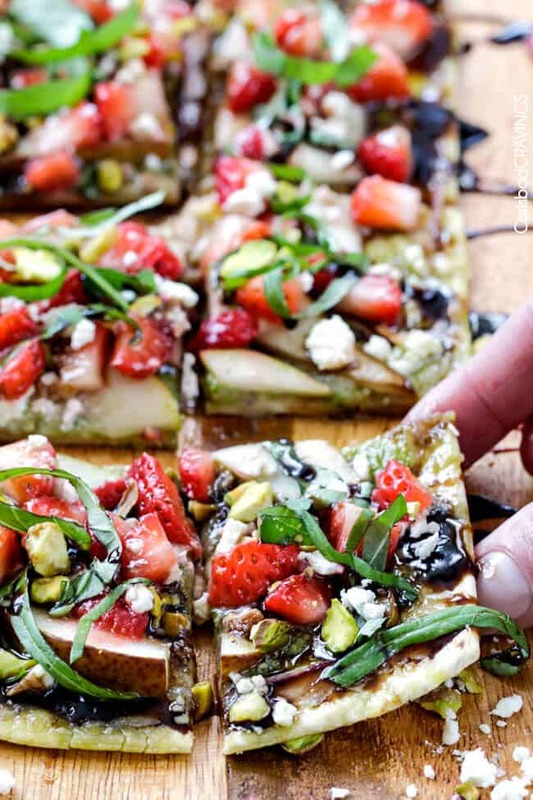 You may or may not need to add more sugar depending on the sweetness of your balsamic vinegar. This Balsamic Vinaigrette is s snap to make by adding strawberries, balsamic vinegar, and splashes of Dijon, sugar, dried minced onion, garlic, paprika, thyme, salt and pepper to your blender and processing until smooth then adding your olive oil and poppy seeds – so you get Strawberry Balsamic Vinaigrette with poppy seeds! 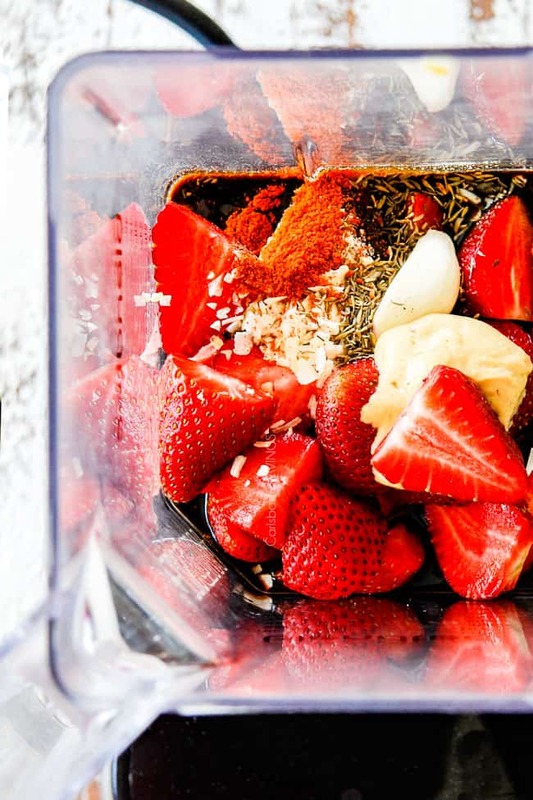 You can make the Strawberry Balsamic Vinaigrette up to 3 days in advance and store in an airtight container in the refrigerator. I prefer making the Vinaigrette in advance because it tastes far superior when cold and the flavors have had a chance to meld. 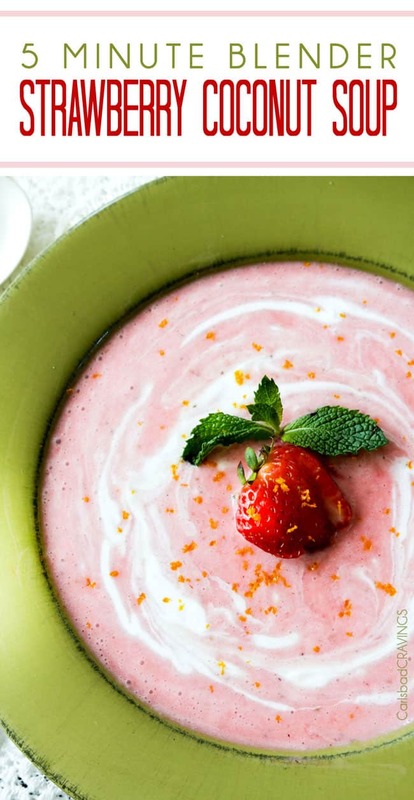 You can prep all of the Strawberry Salad ingredients in advance except for the pears, making this a fabulous make ahead side. To make in advance, add all of the salad ingredients EXCEPT pears (they will brown) to a large bowl in sections so they stay somewhat separated – do not toss together. Cover tightly with plastic wrap. When ready to serve, add pears. If not expecting leftovers then toss with desired amount of dressing. If expecting leftovers, dress individual portions. But don’t expect leftovers. 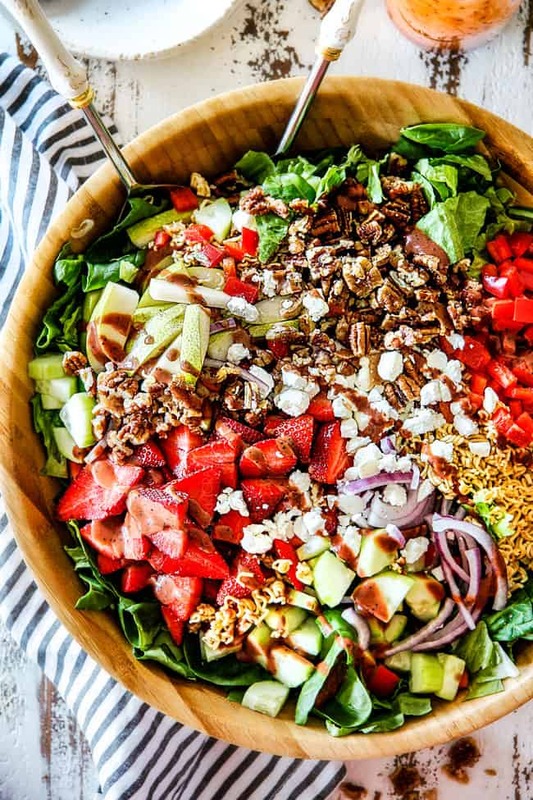 Want to try this Strawberry Salad Recipe? 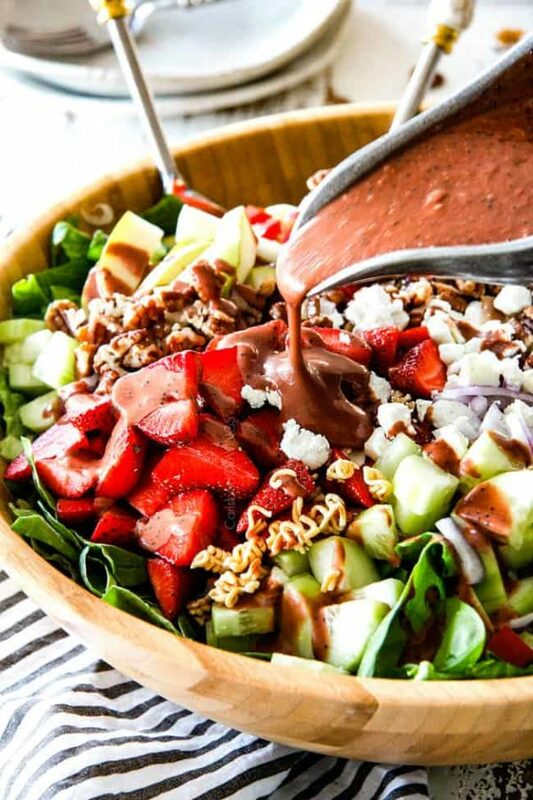 This bright and beautiful Strawberry Salad is LOADED with fresh spinach and romaine, ripe strawberries, creamy goat cheese, crisp red bell pepper, crunchy cucumbers, sweet caramelized pecans, zippy red onion and crunchy toasted ramen then doused in sweet and tangy Strawberry Balsamic Vinaigrette. 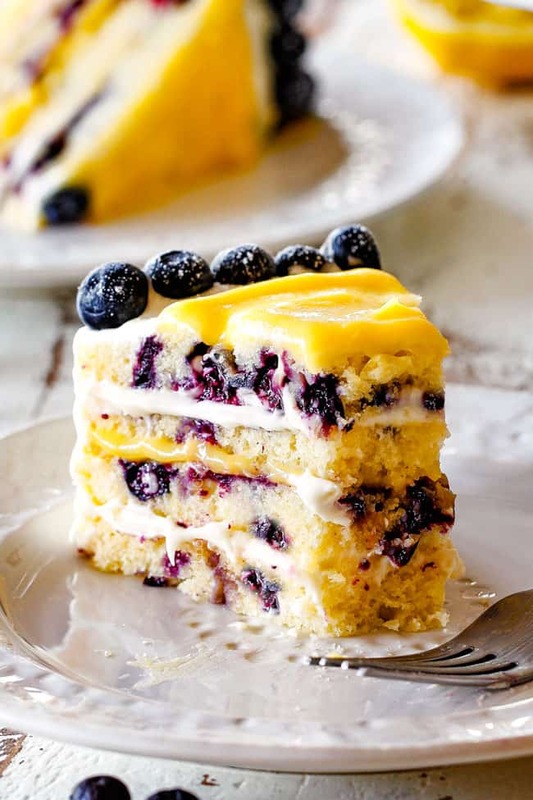 It's a fresh, sweet and tangy crowd favorite perfect for every occasion from Easter to Mother’s Day to today's dinner. The combination of sweet, salty, tangy creamy, and crunchy is everyone-beg-for-the-recipe worthy. Add all of the Vinaigrette ingredients to blender except olive oil and process until smooth. Turn blender on low, and gradually add olive oil in a slow, steady stream. Whisk in poppy seeds. Add additional balsamic for tangier, sugar for sweeter (will depend on your balsamic). Vinaigrette is best served chilled. If making and serving salad immediately, place in the freezer so it can get cold, otherwise refrigerate until ready to use. Whisk vinaigrette just before serving. Preheat the oven to 400 degrees F. Meanwhile, prepare Caramelized Pecans according to directions. Set aside. Add ramen noodles to a baking sheet and toss with 1 tablespoon olive oil. Spread in an even layer and bake until toasted, stirring 1-2 times, approximately 10 minutes. 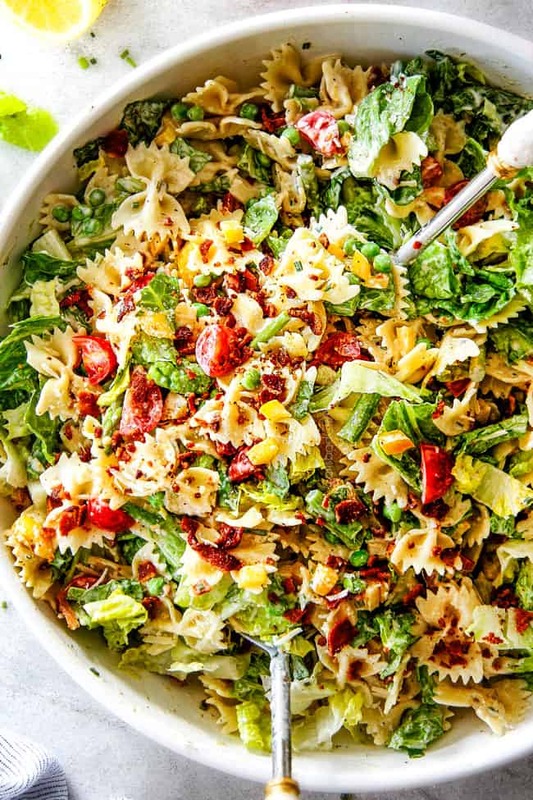 Serving Immediately: Add all of the salad ingredients to a large bowl. If not expecting leftovers then toss with desired amount of dressing. If expecting leftovers, dress individual portions. Serve immediately. Making Ahead: Add all of the salad ingredients EXCEPT pears (they will brown) to a large bowl in sections so they stay somewhat separated - do not toss together. Cover tightly with plastic wrap. When ready to serve, add pears. If not expecting leftovers then toss with desired amount of dressing. If expecting leftovers, dress individual portions. Serve immediately. Hi Jen. You forgot to list strawberries in the salad ingredients and how many. I guess that’s what happens when you post at midnight – sorry about that! 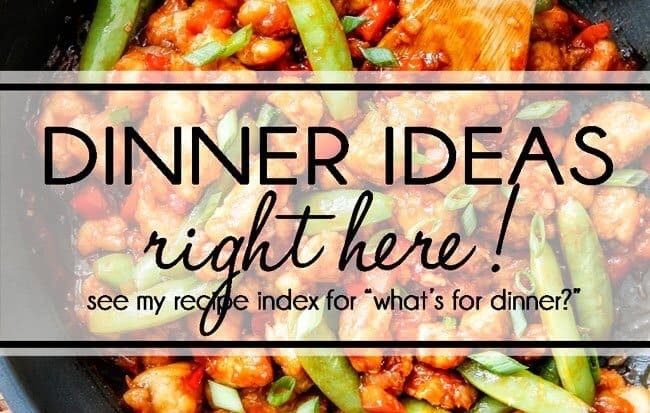 It should be one pound- I’ve updated the recipe. Thanks for catching that Dave! The salad looks amazing! I love all of your recipes. Quick question. The description says crisp red bell pepper, but it isn’t listed in the ingredients. Does that go well in the salad or were you meaning the red onion. Making this for Eater. Thanks! Thanks Blaine, I’m so happy you are enjoying my recipes! It should be one chopped red bell pepper and goes fabulously with the salad :). Happy Easter! This sounds really good, and I plan to make it for an upcoming family get together. One question, do you have a suggestion for a substitute to the ramen? The ramen adds a wonderful crunch but you don’t have to use it – maybe just add additional sunflower seeds. Enjoy! I made this Strawberry Salad for Easter and it was the hit of the meal! Everyone loved it so much- especially the dressing! I love how easy it is too! That is awesome Kelly, I’m thrilled it was a showstopper and easy too! Thank you, happy Easter! Another winner! Seriously every recipe I try is just fantastic! I should work my way through the whole blog! You made my day, thank you so much Melinda!! !